This book is written by T.K.V. 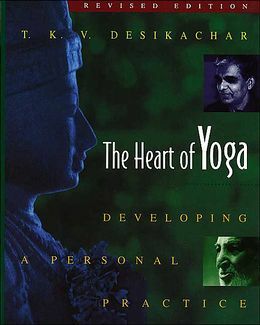 Desikachar, Son of Sri Krishnamcharya and was published in 1995. It is a tribute to his father’s teachings and is a must for all teachers and students of Yoga alike. As the name implies, the book expounds the essence of Classical Yoga with the aim of assisting the development of a personal and deeper practice based on knowledge and understanding. Desikachar covers a broad spectrum of yoga theory and practice and presents it to the reader in an easy and straightforward manner. He achieves this through a mix of explanations written in an informal and personal manner accompanied by various diagrams, pictures (of Krishnamcharya himself) and example practices. “The Heart of Yoga” is a timeless piece of writing on yoga and anyone, no matter which style of yoga or level of experience, will benefit from this book. I loved the emphasis on the breath, vinyasa karma, simplicity in practice and the importance placed on understanding the theory of Yoga and the reasons for the practice. It also includes a clear and inspiring commentary of the Yoga Sutras. It was a pleasure to read a book with unquestionable authenticity that explores a myriad of tools of yoga. This is a book you will read over and over again. A classical text on classical yoga that provides a strong and, I believe, essential foundation for the practice of Yoga. A must for all yogis. Hatha yoga was systematized by Swami Swatmarama in 15th century. That man wrote the famous “Hatha Yoga Pradipika”, describing that way of practice as a path on the way to Raja yoga and as a preparation of the physical body for the more complicated meditations following on the later stages of progress towards samadhi. That discipline includes physical exercises, breathing exercises, cleansing of the internals, art of relaxation and balanced nutrition. In an ancient vedic script it was said, that the atma (our soul) is ‘prisoned’ by the five streams: air, water, fire, earth and ether. According to Swatmarama’s book, only Hatha yoga can release the soul from the elements surrounding it in order to achieve samadhi. Each and every asana in Hatha yoga is targeted to affect specific part of the body, internal organ or a group of them. Carefully selected asanas, performed in a certain sequence, could be used as a treatment for various diseases or pathologies. If one is healthy enough, it won’t hurt to do Hatha yoga either – to prevent disorders on the physical plane. An illness, according to serious yoga practitioners, is a result of wrong distribution of the energy called prana – therefore, some asanas accompanied with breathing exercises are able to restore the proper flow of prana, normalising health. I’m thinking of doing my teacher training in the next year so thanks for the recommendation.